----150+ in the arena…As said, Tatt2 has improved a lot since the last time I seen him. You can always see him doing great things, but not being able to put together a good match. He is almost there now…As usual Ike/Steele with Marx were really over with their music and entrance. The team had one of their better bouts I have seen them in and Ike [even though he has been in the business forever] seems to be improving. I was told him and DK had a real good match a few weeks back…There was a group of heel fans that gave all the babys hell. They called Marx “Porky”, cheered for DK and you could actually hear them over the cheers for CJ in the main event…This is the second EWE show in a row that I have taken an unexpected bump. While DK was going crazy on Baker [throwing a chair at him] he pushed a security guard into me and my glasses bumped for him and my neck was sore the next day. Are you suppose to go to the matches and your neck is sore afterwards? LOL Interactive EWE! !...There are those that still BELIEVE and they live in Ripley. After the Michael/Melton match some fans tried to go after DK. The bad thing is that the guy was not escorted out of the building, which just makes it “ok” for him to do it again. He even threatened to go get a gun. BTW, DK has great heat here – they HATE him! !...Stan Lee was selling an injury and not even on the show. 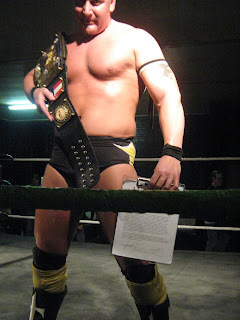 Lee was missed in the sense you are guaranteed a good match when he works, but the show was so good, it would be hard to say he did a bad thing by missing the show…First ever CCW main event was CJ vs DK…KC Gold announced rest of the show after Dustin got superkicked and did a great job! !...Christian Jacobs has stepped it up a notch and just looks to have the most confidence he has ever had. He is in great shape and is probably one of the few guys in the area that the WWE would consider to being on their roster. He is one of those guys that deserves a “look” and I am starting to make a list of guys I want to see him work [Austin Lane, Eric Wayne, Stan Lee, Jon Michael, Alan Steele] I was there for CJ’s first match [actually I submitted for him..lol] and probably been more critical of him than anyone in this area, but he has IT now! !...Thanks everyone!! I had a great time – thanks to everyone who put over my “new” look. It was well appreciated!! 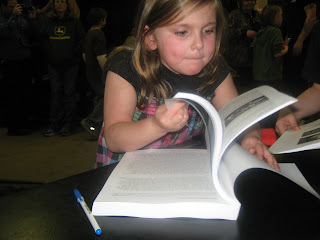 ----The young fan above [looking at Yearbook 2009] is on her road to being the new editor of RRO in about 15 years. When I ask her in front of DK if his match was five stars or 2 stars, she said, "About 2 stars.." LOL She later told us that Brian Steele had the best match! !